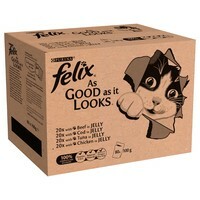 Felix As Good As It Looks is a delicious range of meals that look, smell and taste so irresistible they’re almost good enough to eat yourself. Made with tender pieces in a succulent jelly, each recipe is 100% complete and balanced to give your cat a meal that provides all the nutrition they need for a healthy lifestyle. For an average adult cat (4kg) 3 – 4 pouches per day in at least 2 separate meals. Individual needs vary and feeding should be adjusted as required to maintain your cat at a lean, healthy body weight.